It’s a refrain I’ve heard often from students, who tell me they are completely finished with a piece of writing. More times than not, as I read the student’s work, I see that the piece could use more revisions, more editing, more care. I’ve always felt that having a passionate purpose and a sense of audience would make students more invested in their writing, but the truth is, sometimes they just don’t know that the writing needs work, even when they care about it and know they have a real audience. They don’t know, because they haven’t read their own piece. 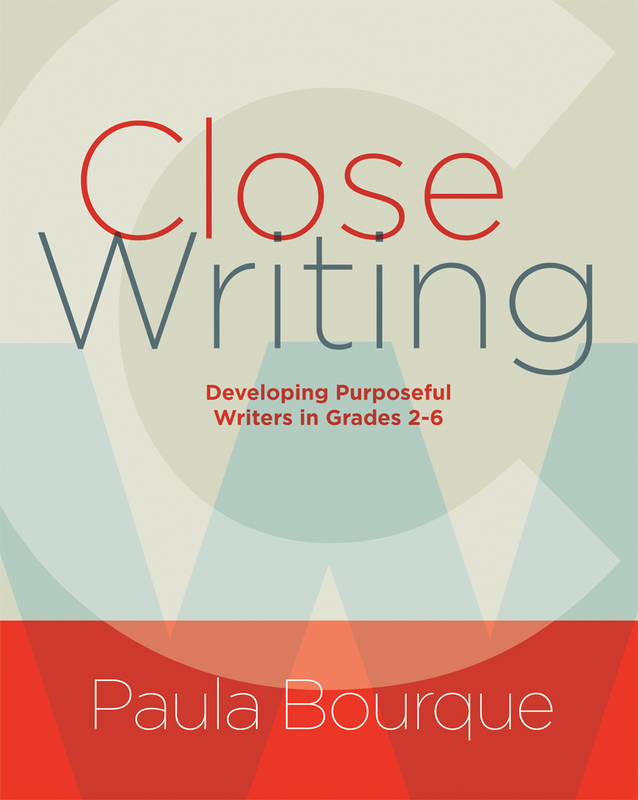 In Close Writing: Developing Purposeful Writers in Grades 2-6 (2016), Paula Bourque writes, “A common concern is that students’ writing often seems incomplete or confusing and that writers did not seem to notice until they read their work with the teacher. The teacher has twenty to twenty-five students in a classroom. We cannot be the sole impetus, encouraging students to closely read a body of writing. It’s ineffective for achieving the growth in writing we are aiming for. We need to teach our students to take on this responsibility” (9). The aim of this book is close writing, defined as “cultivating a relationship between the writer and his or her writing through mindful and purposeful rereading, reflecting and revising (x).” The book is organized in three parts: Guiding Principles, Close Writing Lessons, and Close Writing with Authors. As I read this list, I answered “YES!” to each and every bullet. As a third grade teacher, each “if” on the list matched what I see in my writing workshop and areas where I could use more ideas and strategies. In this section, Bourque references the literacy heroes who have inspired the idea of close writing, including Dr. Douglas Fisher, Kylene Beers, Robert Probst, Christopher Lehman, Kate Roberts, and Louise Rosenblatt. She shares examples of students who exhibit close writing characteristics and a chart of what it looks like to be a close writer. This section really helps the reader understand why being a close writer is so important for student growth. This is the largest section of the book, and an absolute goldmine of ideas! Each chapter begins with a relevant quote, then a personal story shared by Bourque. There is a text box near the story that highlights “the moral of this story”, pulling out the teaching point. Several specific lessons around the topic are shared, as well as classroom anecdotes, student work, charts, and photographs. After the lesson is described, there is a text box that details the step-by-step procedure for that lesson, which is very helpful. Each chapter has “Considerations for English Language Learners”, “The Gist of the Story” (sums up the main points of the chapter), and “Drafting Your Story,” where the reader is invited to answer questions about his/her own teaching practice around the topic. Chapter topics include Close Listening, Close Looking, Close Modeling, Increasing Volume and Stamina, Rereading and Reflecting, Revising, Eyes and Ears of an Editor, Assessment and Feedback for Close Writing, and Publishing and Performing. Each chapter also has “Peek Inside a Classroom”, which was one of my favorite parts to read! Bourque is a K-8 literacy coach in Augusta, Maine, and the teachers she works with and the way she collaborates with them was so impressive. 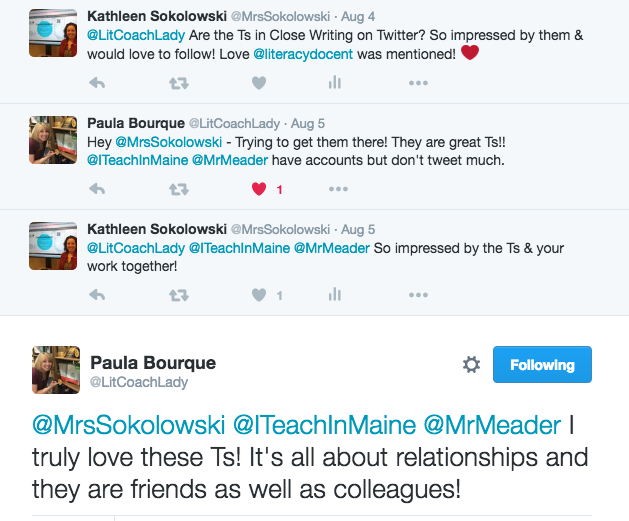 I even sent Paula a tweet, asking if the teachers in the book were on Twitter so I can follow them! There were so many brilliant ideas in this section. I underlined, starred, and circled many strategies to try with my third grade writers. One idea I loved was “Rainbow Revision” (169), where aspects of the writing are color-coded when reread during revision. For example, students would underline sequences and transitions in green, thoughts and feelings in blue, dialogue in pink, etc. Once students are done reading and highlighting, they can see where they might need to revise and could write a “Next Steps” note. In this section, Bourque interviews several published authors about how their writing process, especially thinking about how they revise. Writing processes are shared by Megan Frazer Blakemore, Rob Buyea, Selena Castrovilla, Erin Dionne, Jennifer Jacobson, Lester Laminack, Cynthia Lord, Kate Messner, Lynn Plourde, Liesl Shurtliff, Melissa Stewart, and Tamra Wight. Bourque provides ideas for ways to engage with authors. The book ends with an Epilogue, in which Bourque reflects on being a close writer while drafting this book. Paula wrote a post about this experience during our Author Spotlight week last spring. Some final words of wisdom: “If we don’t love what we do, we won’t do it for long. Writers need to find ways to enjoy writing and have some fun. We love what bring us joy and pleasure, if this isn’t present in our writing classrooms, our students will never fall in love with writing” (275). In a sea of professional texts, why should you read Close Writing? If you have struggled with the “I’m done!” issue in your classroom and if your students need more strategies to help them envision ways to improve their writing, this book is absolutely for you! Paula infuses personal stories and classroom anecdotes throughout the book, which makes it highly engaging. Some books are wonderful at explaining theory, but never get to the practical application of how that looks in real-live classrooms. In this book, Bourque manages to provide a solid foundation of theory and then example upon example of ways to try it with students. I love the section where authors share their process and I am thinking of ways to integrate more of those stories into my writing workshop. I believe this book is a MUST READ for writing workshop teachers, and even though it is geared towards grades 2-6, I think the ideas could be adapted for younger and older students. Thank you, Paula Bourque, for creating such a rich professional text that will surely help many of us teach our students to be close writers. This giveaway is for a copy of Close Writing. Many thanks to Stenhouse Publishers for donating a copy for one reader. For a chance to win this copy of Close Writing, please leave a comment about this post by Friday, August 26th at 11:59 p.m. EDT. I’ll use a random number generator to pick the winner, whose name I will announce at the bottom of this post, by Monday, August 29th. If you are the winner of the book, I will email you with the subject line of TWO WRITING TEACHERS – CLOSE WRITING. Please respond to my e-mail with your mailing address within five days of receipt. Unfortunately, a new winner will be chosen if a response isn’t received within five days of the giveaway announcement. Dawn, be sure to respond to my email with your mailing address within 5 days or I will have to select a new winner. Thank you everyone for all the comments and hope you get a chance tor read Close Writing! Thanks for bringing this book to our attention — it sounds great! Completely agree about kids not noticing errors/ repetition until they are reading their piece with you… and you are sitting their while they are catching their own mistakes. It just makes me think of how far they could be go if that was taken care of before meeting with me. This review piqued my interest and I would love a copy of the book to learn more! What a great concept for a book! I cannot wait to read it! We focus so much on close reading…it is inspirational to also think in terms of close writing as well! Let’s take the pain out of revision. Looking forward to digging into this new book! This just happened to me this week–student gets done and I direct to get back in and review their intro (hook) and add sensory details. I got that blank stare, like “Why? ?”…I am sure I will get writing that lacks those lessons I just taught. Ugh! I am so interested in how to get them to self motivate to get back into their writing!! This sounds like a wonderful resource. I am especially excited about Part 2 — Close Writing Lessons. Thank you for the detailed review and the chance to win a copy of the text. What a wonderful way to start the school year! I often find myself frustrated with these “I’m done” students because it happens so regularly. I am fighting a lot with the ones who think their writing is good and doesn’t need revision. This is the most frustrating. I have found that it’s better when I write with them and share my work, but there’s always someone. 🙂 Would be nice to have more strategies for helping them and myself! I definitely want this book! Yes to almost all of those questions!!! Thank you for sharing. Oh, oh, oh, this sounds like such a great resource. Can’t wait to read it–thanks for the opportunity! What a practical and honest teaching resource. Thanks for the review! This sounds like a book that will benefit me and my students! Yes for EACH of the bullet points. I found myself answering YES to all the bullets too! It sounds like this book would save me constantly trying to clone myself for writing conferencing sessions. Definitely sounds like a great resource! This looks to be a great resource written specifically for me! I can always use some fresh ideas for writer’s workshop! I would love to have this book! This book sounds like it was written for me! I answered yes to all of the questions as well. It would be a wealth of information for my work with students and coaching with teachers. I work in 24 local schools with struggling writers from 5 to 13 year olds and there are many teacher texts about emergent writing but not a lot for older students. I am doing a sabatical reseach project next year in writing and would love a copy to read and show other teachers around my schools. I would love to add this book to my professional library. Thank you for sharing this valuable resource! Thanks for sharing this book! I too answered YES to most. I know many students who need this and many teachers who would love to share this book with me!! I have this problem nearly every day. This book sounds like the answer to my prayers. If I don’t win a copy I will have to buy it. Oh my this book is for me! I need to get my hands on this book ASAP, my students writing depends on it. I need more books that give lesson ideas. Would love to read and learn more! Like a few other responders, I believe this would be a great book to share with others in our school community! This looks like just what I need to start the year off! Looks like a “must read” for our school as we take a closer look at writing this year! It sounds like the lesson section will be packed with great ideas and organized with tons of resources. Can’t wait! Close Writing seems like a must read for anyone who has a classroom full of writers! Can’t wait to check it out! Especially intrigued by the mentor authors section. Very helpful book review…I’m convinced that I want to read and learn from the ideas in this book! I’d love to read this, discuss it with my colleagues, and use it to deepen my own practice in teaching writing! This is what my campus needs! I’m on a 2-5 campus with 36 teachers that teach reading and writing, we all need to get on the same page with our writing focus. This seems like a practical tool and manageable for a campus with out breaking the bank. Thank you for reviewing this book. I would love to read it. I would love to read this book. It sounds like a goldmine of ideas to help writers strengthen their work and take ownership of their pieces and writing lives. I love Kylene Beers and Robert Probst! This book sounds like a wonderful resource, and teaching writing I can always use more! Thank you. I am excited to start this school year! Even after 21 years I get butterflies when August rolls around. I love this blog and would love to read Close Writing so that I can help my kids develop as writers. Close Writing sounds like the counter part to Nancy Boyles Closer Reading. I know that my colleagues and I would love to use this as part of our professional growth. What a thorough review! Thank you! I want to read this for three reasons: to improve my own writing process, to be able to help students develop a stronger writing process, and to be able to better support teachers in their writing workshop facilitation!! Yes, yes, and yes! I would love to win this book and learn strategies to better help my students become better writers! I’m very excited to read this book because I’ve been frustrated with the “I’m done” announcement, and then upon reading the writing, I’m so dismayed with the quality. And even when I take the time to confer with the student 1:1, I find I’m doing the editing, not the student and there is just not enough time to 1:1 confer with everyone in this way. I can’t wait to read this book! I love the “Rainbow Revision” idea! I would love to try some close writing strategies with my 2nd graders this year. Thanks for a great review. Thank you. This resource would surely help my students develop their writing personalities this year, as well as helping me to reflect on my practice. This reminds me of the meta cognition explanation of “I’m thinking of what I’m thinking. In writing students need to do more of their own thinking. This book sounds perfect for incorporating writing “metacognition” Thanks! I have been thinking a lot lately about the creative tension that builds throughout the year when we believe in the theory and the mindset but then we run out of material to help every learner through the writing process. Obviously, all of “my moves” don’t connect with every writer and it is comforting to have texts around us to dip and in and out of for support. In the spring, we bought Close Reading as an addition to our department’s professional library and I found myself wanting to mark it up, lol, before anyone else could read it. I would love a copy of your book. I am a reading interventionist working with students in reading at all levels Looking forward to hearing from you. As you said, Kathleen, there is a sea of PD books out there: so many books, so little time. Your review here has convinced me I need to read this one. Thanks for a clear, compelling review. Love the idea of close writing and helping students to be more mindful! Yes yes yes yes to every question! I seriously need this book!!! It sounds just like what I’ve been looking for to use with my 4th graders. I would LOVE to win a copy! I love books that give me ideas that I can use tomorrow. This sounds like a good one. Thanks for the review. Sounds like a great book with some wonderful ideas. I find my students saying “done” all the time when their writing isn’t quite done yet. Thank you for your review of this book. There are so many books and so little time and money, and it’s frustrating to purchase a book that you think will be helpful and then it’s not. It sounds like a wonderful read. Thank you for sharing your thoughts. Sounds like a book that will help me help all of my young writers! This book is on my reading list! Thank you! I will be reading this book this year. Thanks! Thanks for sharing! The book loks great! I would love to share the information in this book with my middle schoolers! Can’t wait to read this book and learn! That sounds wonderful !!!! I would love to own this ! This is exactly what I have been looking for…. how to handle “I am done!” I cannot wait to read this book. The “ifs” have all been spotted in my classroom! I would love to have this book! 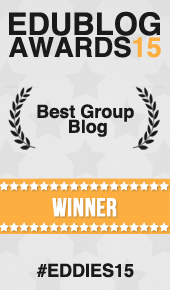 Thanks for the great blog which I follow with enthusiasm! As a special ed teacher trying to help students learn how to edit and revise the pieces written independently in class, I have been so frustrated! It is usually difficult for my kids to write to begin with, so revisions see like cruel and unusual punishment to them. From the outline of the book, it is evident there is a great deal more I can do to help them value their own pieces and see ways they can make them even better. Thank you! Kathleen, your posts continue to move and inspire so many. Thank you! I’ve read lots of personal books about writing, but this one sounds like a gem! This book sounds awesome. I am departmentalizing this year teaching Writing and Science. Revising and editing are the most difficult to teach.I’d live yo win a copy!!! Thanks for the book review. I would love to read this book. I am passing this blog post on to all my colleagues. Oh my! All of the “ifs” describe my classroom of 4th graders for the past few years. This school year we are looking for guidance in our writing program. Looks like this book will provide lots of suggestions that we could use. Thank you for sharing! This book looks like a gold mine of information! Definitely needs to go on my “To Be Read” list. Thanks for sharing! I wholeheartedly agree that love comes first, Karen! My definition of writing workshop to teachers in pd is that it is a carefully-preserved time to help students fall in love with the craft of writing. I would love to see this book! Today I committed to Action Research and writing ownership is at the core of my plan! This looks like a great resource. I have already asked our learning support coach to look into this writing resource. It’s definitely on my wish list! This book seems like a fantastic writing resource! Sounds like a great book full of ideas! I like the idea of looking at an author’s writing process. “I’m done!”, could describe so many of my sixth grade students. I will definitely be reading this book. As a first year teacher AND a teacher of a reading intervention class, I believe this book would be an invaluable resource. This book sounds like it would help me work with myself and students in using the lessons taught and pulling out what we could use to support ideas . As a State Reading Coach, I would love to use this resource in our professional development courses! As a State Reading Coach, I am eager to include this resource in our professional development plans! I would love the opportunity to receive this book! Such a great tool and resource! I can’t wait to read this book! I teach third grade and I hear “I’m done” all the time! Great review…adding this to my TBR list! This book sounds fantastic! I teach first grade but struggle with meeting the needs of my most accomplished writers who are well beyond their peers instill and craft. This book could be so helpful with those students. Love the idea of “rainbow writing”. What a great visual way to look at revision. Thanks for an amazing review…adding this to my TBR list! I still haven’t read Close Writing, but I know I need to!! : ) Thank you so much for reviewing and sharing! I read as much as I could about this book online. I would love to add Close Writing to my professional library. How fun it would be to win a copy rather than purchasing it out of pocket. Paula has so much valuable information on her blog so I’ m positive her text will be a valuable resource. Sounds like a great read! Thanks! Thanks for sharing. This sounds like a book any writing teacher needs. This book sound like a gem! I would love to us this as a resource in my classroom for my writers. Thank you for sharing! Pick me! Pick me! This book is exactly what I need. Thanks to two writing teachers for a useful, genuine, inspiring writing blog. I find great pleasure in reading a professional book where personal anecdotes are included. This sounds like a great title to share with the K -5 teachers I have the pleasure to work with. What an incredible resource! Will definitely put this book on my wish list and share with others! I’ve successful used Rainbow Revising with my students and would love to find other strategies that are as successful as that one. This summer I’ve developed my own revising/close writing strategies and would love my students to do so, as well! Thanks for a great post! A much needed book for so many classrooms. The structure sounds very reader-friendly. Looking forward to reading it! This sounds like a fabulous book. I would love to have this book as a resource for motivating students who are done first. I was lucky enough to meet Paula at ILA in Boston. Her session with Lynda Mullaly Hunt, Cynthia Lord, Jennifer Jacobson, and Caroline Eldridge was filled with terrific ideas for fostering student writing. Can’t wait to read this book! I would love to use this book in my 4th grade classroom. I am excited that the bulk of the book is focused on lessons not just big ideas. We are implementing writers’ workshop and Calkins’ UofS this year. Already some teachers are asking me how to handle those students who write once and call it done. As the literacy coach, this book looks like a resource I absolutely need to have to support my teachers! I would love to win a copy of Close Writing. Improving writing is a goal of my district! This book sounds so helpful! I’d love to read it! Thank you for sharing! Wow! This looks like a must have for anyone doing writer’s workshop! I’m always dealing with the “I’m done!” Issue with my 2nd graders! Sounds like a great book! I struggle so much with this in sixth grade, for some students I can quickly see how to help them take it further, some students do a great job initially and I’d love to be able to provide some more helpful guidance. This book sound like a valuable read. I would love this book!! Thanks! Sounds like a great book. I’d love to have a copy. This book looks amazing! I can’t wait to read it and put it to use in my classroom. This book sounds great! Thank you for writing about it! The whole purpose of the book “cultivating a relationship between the writer and his or her writing through mindful and purposeful rereading, reflecting and revising (x).” hits the mark and your review hits the mark as well! Thanks! I need this book for my third graders! I would love a book that helps me teach students to revise independently. This book sounds like it holds the key to extending the independent writing time in a meaningful way. I most certainly answered “yes” to the questions on this list, and your post left me wanting to read this book. I’d love a copy. I answered YES as well – I feel like I need this book, as my students are not going to receive any marks this year – ONLY FEEDBACK! That is one way of letting them know work is truly not finished. I’d love to read more. Thanks for the post and for doing this! What a great book! I would love a copy of it. This book sounds wonderful! It sounds like it helps make students more aware of the work that needs to be done, rather than teacher having to point it out. The book sounds wonderful! I am always looking for ways to encourage students to see the value in revision, so I’d love to read more of Paula’s stories! Most of my students think that their work is perfect after the first draft. I need this book!! This seems like a great resource! With the emphasis on close reading, this would be a great compliment to my coaching. Yup, as a fellow third-grade teacher the questions resonated with me too! I love that there is special attention to ELL students. This is definitely a book I will have to buy! Thanks for the thorough review. This sounds like a comprehensive text. I think the idea of pulling out the teaching point and then also calling out the steps if each lesson is important. So many teachers get lost in the midst of a lesson, or are unsure about how much to teach. Writing instruction is really about teaching points and teaching stamina and revision and independence. Except 2 writing coaches, I am uncertain that I ever had instruction on revision! Excellent! Thank you for your thoughtful anaylsis and summary of this resource!! It’s going on my TBR list!! I’m intrigued by the chart of what it means to be a close writer that you mentioned. And rainbow revision and…all of what you mentioned. Thanks for sharing! Sounds like a fantastic book and just what I need!! Guiding principles, theory and a plethora of writing lessons! This book sounds like a wonderful and practical resource. Moreover, a teaching and learning book in which the goal is to cultivate relationships between the writer and their work is essential. I teach ELLs and have also used color for my students. I call it rainbow writing, which helps them to clearly see what sections they are on, next steps, and allow for editing/revisions. I will absolutely incorporate rainbow revision!!! I would love to own a copy and turn-key it back to staff during PD! Thanks for sharing. I love that this book seems to suggest that good writing is correlative to good reading requiring “close” examination & depth. Sounds like a great read! Not only do I want to read it for personal growth, but I also want to share it with my colleagues. Writing is a focus at our school and we are always looking for ways to engage our students. Sounds like a wonderful professional resource. The quotes from the authors could make a great resource for author talks at the beginning of the workshop. This resource looks like a goldmine for writer’s workshop. It is now on my wishlist. This point is one that many face with young writers: “if you have students who consistently think that their writing is done and can’t imagine how it could be better,” as writers are very hesitant to revise something they worked so hard to create. I’m excited to see what Bourque has to say about helping writers become passionate about rereading and revising. I’ve been dying to buy this book ever since I was lucky enough to attend a Close Writing session with Paula Borque at ILA16. She had so much to share and her ideas are so “do-able!” I’d love to have this resource to enrich my teaching. I too answered YES to all the questions. Here’s my question for you. I teach second grade. While the book is suggested for grades 2-6, would it be helpful for me as I develop my writers? This book sounds like it might be a lifeline for teachers of writing workshop. What resonated most: That the book is about “cultivating a relationship between the writer and his or her writing through mindful and purposeful rereading, reflecting and revising” and “We love what brings us joy and pleasure; if this isn’t present in our classrooms, our students will never fall in love with writing.” We have to be about helping students fall in love with the craft of writing! It would be so amazing to read this book and bring it to my teachers through a book study! I am especially interested in the sections for ELL! I would so appreciate a copy of this book! This sounds like a wonderful and practical resource to help our writers take ownership of their writing! I, too, answered YES to most of them on the list. I’d love to own a copy of this book. Thanks for sharing!